Mandalpatti is one of the best tourist spots in Coorg , Karnataka , India . 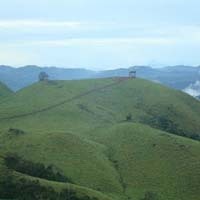 Mandalpatti hills are located around 25- 30 km from Madikeri town en route to Abbi falls. A right deviating road just 4 kms before Abbi Falls will lead to Mandalpatti. As bus facility is not available yet taking a cab or own vehicle is advised. Once has to take entrance tickets from the authorities at the base of Mandalpatti before trekking the hills. Make sure to take water and food along as there are no shops around there. Once on the top of the hills the beauty of Mandalpatti is unwrapped. Far stretching green mountains and the cool breeze will definitely make one feel like heaven.